Anerlie the dimensions o the cross are formally established syne 1889: "The coat o airms o the federation is, athin a red field, an upricht white cross, whose [four] arms of equal length are a sixth longer than their width." The size o the cross in relation tae the field is no formally established except on the naval ensign, for which the ratio o the size o the cross tae the height is 5:8, an tae the lenth is 5:12. A ratio o 2:3 or 7:10 tae the span o the banner is uisual. Uise o the white cross as a military ensign (attached tae the cantonal banners in the form o strips o linen) haes been uised in the Auld Swiss Confederacy syne the 14t century, but the modren design o a white cross suspendit in a square reid field wis introduced anerlie efter the end o the Napoleonic period, in 1815, an wis introduced as offeecial naitional banner in 1889. ↑ "Anhang I. Die Schweizer Flagge zur See", Bundesgesetz über die Seeschifffahrt unter der Schweizer Flagge (SR 747.30) (PDF) (in German), The Federal Authorities of the Swiss Confederation, p. 65 CS1 maint: Unrecognised leid (link) . 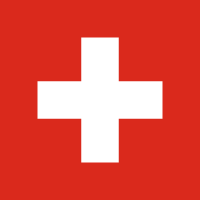 Wikimedia Commons haes media relatit tae Flags of Switzerland.